- Cloud computing, analytics, mobile access, social media, and security (CAMSS) put new demands on businesses and IT for enhanced resilience, performance, and scale. - The volume of data and increased file sizes push networks to their limits and stress quality of service. - A powerful, workload-optimized, open, agile, and highly secure IT infrastructure is required to meet customer expectations. 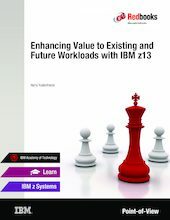 This IBM® Redbooks® Point-of-View publication discusses the new I/O capabilities in IBM z Systems and identifies ways the enhancements help the enterprise.